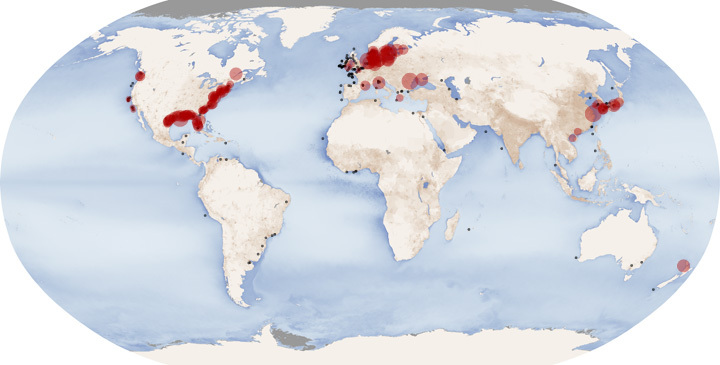 The size and number of marine dead zones—areas where the deep water is so low in dissolved oxygen that sea creatures can’t survive—have grown explosively in the past half-century. Red circles on this map show the location and size of many of our planet’s dead zones. Black dots show where dead zones have been observed, but their size is unknown. Naturally occurring low-oxygen zones are regular features in some parts of the ocean. 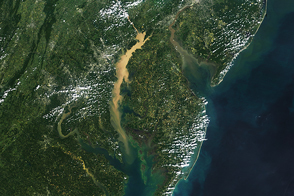 These coastal upwelling areas, which include the Bay of Bengal and the Atlantic west of southern Africa, are not the same as dead zones because their bottom-dwelling marine life is adapted to the recurring low-oxygen conditions. However, these zones may grow larger with the additional nutrient inputs from agricultural runoff. Map by Robert Simmon & Jesse Allen; based on data from Robert Diaz, Virginia Institute of Marine Science (dead zones); the GSFC Ocean Color team (particulate organic carbon); and the Socioeconomic Data and Applications Center (SEDAC) (population density). 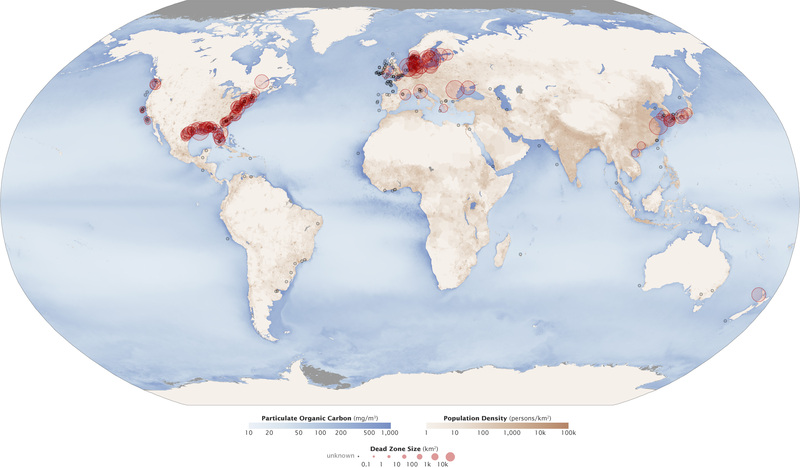 The number and size of ocean dead zones is closely connected to human population density.